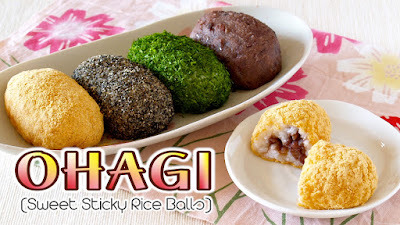 We enjoy Ohagi or Botamochi as an everyday snack but it is commonly sold in stores during the buddhist Higan holiday in spring and fall, and Bon holiday in summer as well for an offering to the ancestors. Homemade one is very soft and delicate!!! 1. Wash rice and leave for about 30 minutes. 2. Put the rice in a pot, add water to the appropriate level indicated in the pot. Place the pot into the rice cooker. Cover and press the button to start. 3. When it's done, mash the rice with a wooden pestle then toss the rice with a rice paddle (or you can use a potato masher). Repeat this to mash halfway through or until you get the grain texture to your preference. 4. Divide the rice and Tsubu-an (red bean paste) to make them easy to work with. Red bean outside: 40g rice + 60g red bean paste. Rice outside: 70g rice + 30g red bean paste. 5. Use plastic wrap or wet your hand with water to form them into an oval shape. Coat the rice ones with Kinako, sesame seeds, or Aonori.